A long time ago, when the first polite compilation 'Be More Polite' had just about broken even, I decided it was time to put out another, for some reason. I started collecting songs from people who I was friends with or liked the music of and had soon got most of them delivered to me. While I was waiting for the last few songs promised to me to arrive, however, I got distracted. It might have been by a dog with a poofy tail, or maybe just something shiny, or even writing a dissertation then starting a new career as a teacher. Whatever happened, it meant that until now the songs just sat on my hard drive unlistened to and seemingly unwanted. Then one day Henry just made me send them to him and said "I'll sort it out" and god damnit it he did! 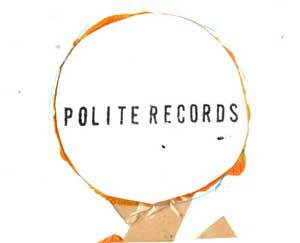 Within days, we can now present to you the second Polite Records compilation, entitled 'Mind Your Manners'. This record is a real goodie bag, featuring songs from such illustrious people as: Rachael Dadd, Rozi Plain, Robin Allender, The Swede, Daniel Davey, John Doak and, of course the Polite regulars Olly Watson, Henry Ireland and Phil Dodd (collectively: Grizzly and the Bears). The CD comes packaged in Henry's revolutionary 'single sheet of A4' system (patent nowhere near pending) and will make a brilliant addition to the collection of any Compact Disc Connoiseur.